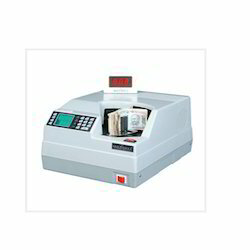 Prominent & Leading Manufacturer from New Delhi, we offer floor bundle note counter, desktop bundle note counter, heavy duty bundle note counter and bundle note counter. These Our Floor Bundle Note Counter have stood various stress tests, real time rigid use and are experts in handling various forms of currency – old, new or soiled currency, All Alike. 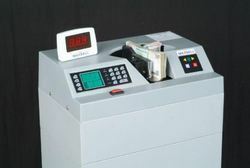 These Cash Counting Machines have the right appetite to deliver results that impress our clients. The main features of this machine include Micro Controlled Based Technology which gives an excellent output in terms of accuracy and speed. Steel Spindle: The steel spindle is provided to work on Leakproof Air System. This ensures that the machine counts with rigidity and delivers ultimate performance. High Tech Design: The mechanical design is producing excellent results due to precision cut components with less 0.1mm deviation. Two tier bases for sturdy performance. Packaging Details: Wooden crate packing available on request at extra cost. Since our establishment, we have become the famous manufacturers, trader, and suppliers of a high-quality Desktop Bundle Note Counter. The offered note counter has inbuilt automatic UV detector optional. 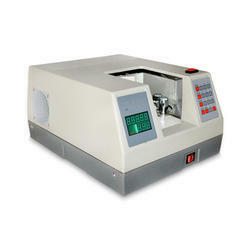 This note counter is manufactured with quality material by our competent professionals. Furthermore, our note counter is tested on numerous parameters in order to assure its flawlessness. We are an eminent entity engaged in providing an extensive assortment of Heavy Duty Bundle Note Counter. The offered note counter is provided in several stipulations as per the need of customers. This note counter is designed in compliance with the quality standards by using the best raw material. Furthermore, this note counter is known for its smooth performances. 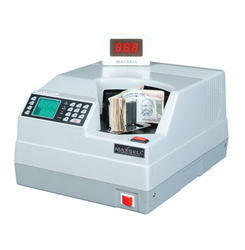 Maxsell MX600 Bundle Note Counter handles loads of cash whether new, old or soiled currency alike. For tasks like counting banknotes strapped or bundled, MX600 can be a life saver. Its rapid counting speed and conveniently located to currency placement makes it a wise choice for the customer who needs faster and accurate counting for their bulk cash. The filters are located at the bottom portion of the machine covered with a door. Which means the customer can them clean the filter periodically without having to wait for maintenance. For bulk cash handling MX600 desktop is the best choice. It can operate continuously for hours together. We have designed sleek model in MX600 desktop. OEM customers service also available. Steel Spindle: The steel spindle is provided to work on LEAKPROOF AIR SYSTEM. This ensures that the machine counts with utmost accuracy. In - built Dust Extractors: The Jumbo size dust extractors ensures huge dust collection, hence reduces frequent need for maintenance of the machine. Design: The mechanical design is producing excellent results due to precision cut components with less 0.1 mm deviation. Injection Mould Top: The ABS Top which is injection mould and is around 6mm thickness sustains transport pressures hardships. It also gives the machine a sturdy outlook. Disciplined Assembly line: The highly disciplined assembly line results in perfect production. All components are tested both in pre-assembly and post-assembly sections. Easy movement: Castor wheels provide convenient movement of the machine inside the premises.